This is the best buffalo chicken wing recipe. I also include my homemade blue cheese dressing that makes this appetizer even better. 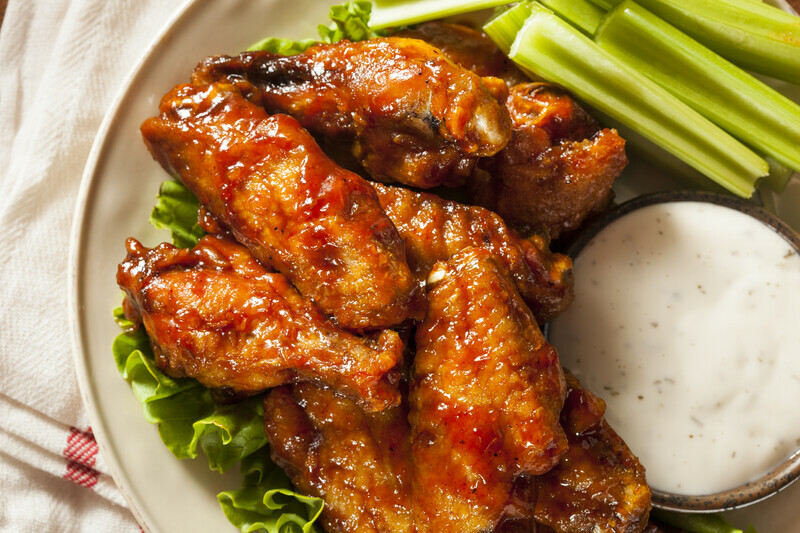 The secret to perfect buffalo wings is homemade hot sauce. Heat the oil in a large heavy skillet or deep fryer to 375 degrees. Deep fry the chicken wings until they are done; or about ten minutes. Remove and drain. Melt the margarine in a large skillet, and stir in the vinegar and hot sauce. Season with salt and pepper to taste. Add the chicken wings to this sauce and stir over low heat to cover completely. For mild - simmer 15 minutes; For medium - simmer 30 minutes and For hot - simmer for 45 minutes. NOTE: You may also bake them at 400 degrees for 40 minutes. Because we are starting this recipe with homemade mayo and not store-bought, you will find this so creamy and good that you will want to eat it with a spoon. This is a masterpiece with homemade Buffalo wings and much more. Place 1/4 cup of oil, salt, cayenne pepper, mustard and egg into a blender or food processor and pulse until completely blended. SLOWLY add a thin stream of the remaining canola oil while the appliance is running until all is processed. Add the lemon juice and vinegar and whip until smooth and creamy. Store in a airtight container in the refrigerator until you use it. In a small bowl, mix the vinegar and milk together - mix and let stand for 10 minutes. Add the blue cheese and mash with a fork till this looks like cottage cheese. Stir in the sour cream, mayonnaise, sugar and garlic powder. Season to taste with salt and pepper. Chill till ready to serve. This may be refrigerated if sealed in an airtight container for up to two weeks.